After three rounds dominated by Club d’Adelaide, Round 4 was Prospect’s time to shine. Emulating Adelaide’s efforts in Round 2, Prospect has now become the second club to have ever achieved a clean sweep of the gold, silver and bronze medals. 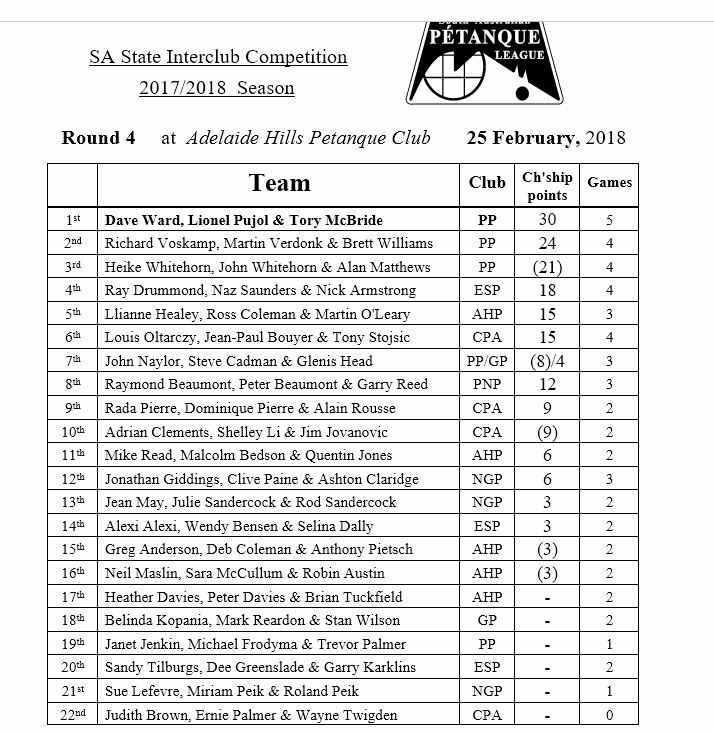 Congratulations to Dave Ward, Lionel Pujol & Tory McBride, winners on the day, and to Brett Williams, Martin Verdonk & Richard Voskamp and Heike & John Whitehorn & Alan Matthews respectively. This feat has brought the championship back to life, just as it was starting to look like a one horse race. Prospect are now only 24 points adrift of the lead, erasing more than half the deficit in one fell swoop, and well within striking distance with two rounds to go. As for the other clubs, there were no changes in the order of the premiership table. However, Eastern Suburbs, who coming in were tied with Prospect in second place, are now closer to fourth than they are to second. In the battle for fifth position, Gawler managed to just keep their noses in front of Port Noarlunga, as Novar Gardens doubled their points tally for the season to also stay in the hunt. Meanwhile, the host club Adelaide Hills appear to be firmly entrenched in fourth spot. Their record squad of five teams may not have yielded the overall dividends they perhaps might have hoped for, with the home ground advantage, but it was indicative of the club’s recent renaissance. Thanks to their friendly team of volunteers who helped make it such an enjoyable day. Posted in Competition, Results, State Competition, Uncategorized.